Liquid ground is a liquid used in copper plate printing to make the surface of the plate corrosion proof. Applying ground shields the non-image sections and protects the plate surface from corrosion. When performing line etching and other etching methods, the reverse side of the plate must be treated in advance to prevent corrosion, and the front side, where the image will be drawn, coated with ground. Needles and other tools are used to peel off the ground on the plate surface to draw the image. These exposed lines are then corroded with a mordant such as aqueous nitric acid and aqueous ferric chloride, etc. to create grooves. Ground must have superior water resistance, acid resistance and adhesion properties and must be easy to dissolve in solvent. It must also enable sharp lines to be drawn with a needle without cracking. It is applied by pouring a generous amount in the center of the plate and gently tilting the plate to spread the liquid over the entire surface. Allow excess ground to drip back into the container from one of the corners. The ground is thus drained. Another way of applying ground is to use a flat brush to coat the plate directly. Liquid ground can either be purchased or produced by dissolving hard ground in its solid form with solvent such as ligroin. When dissolving solid ground, it is best to make a thick solution first and then thin it out gradually, testing it for ease of use in the process. Ground is made from asphalt, beeswax, pine resin and mastic (frankincense) so these ingredients can be dissolved with solvent to make liquid ground too. 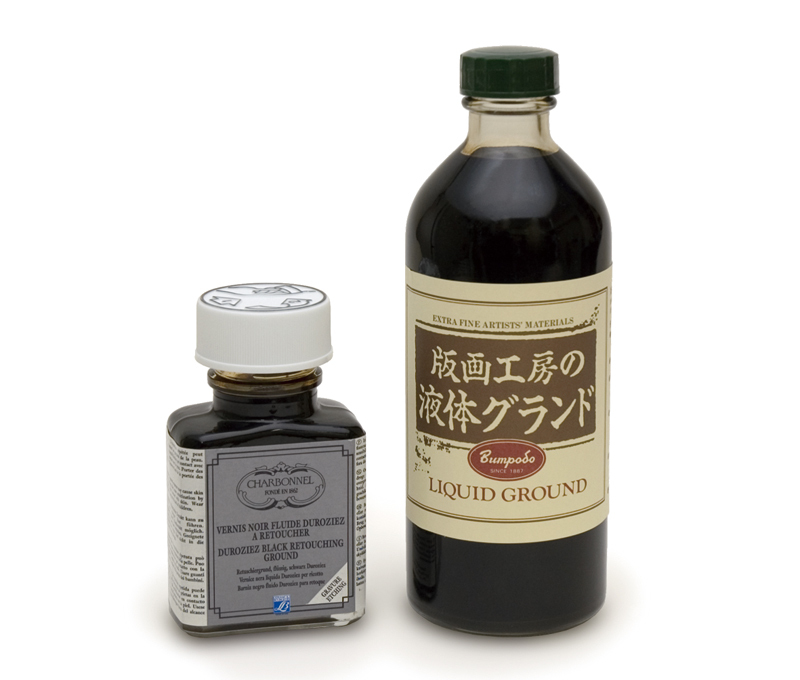 Liquid ground can be purchased at art supply stores and specialist stores that handle printing supplies.